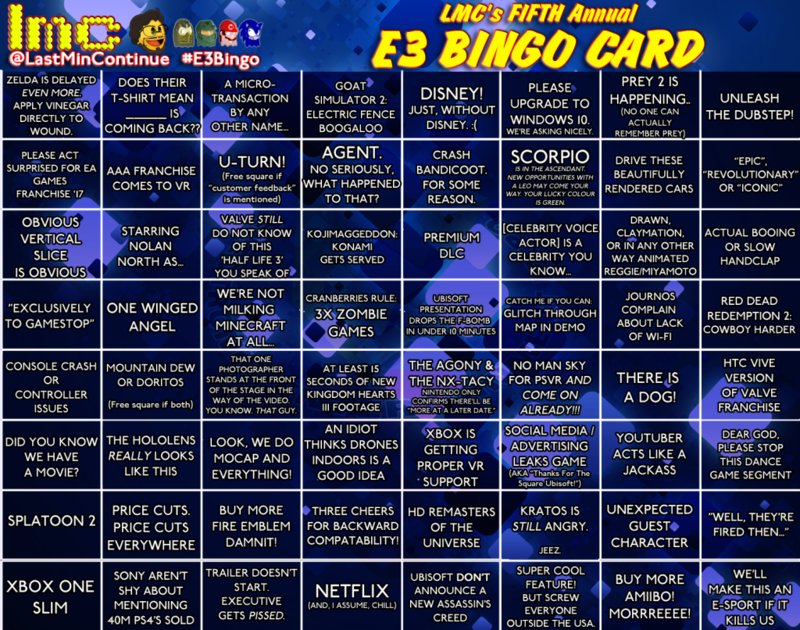 Home » Serious News » Here For The Fifth Year, The LMC E3 Bingo Card – 2016 Edition! It’s that time everyone. That point where we dish out our annual Bingo card for E3 (and things surrounding it), now in its fifth consecutive year. Once again things have chanced and the 2016 version is actually ever so slightly smaller than the huge2015 one. I’ve also dumped the categories for the sake of ease. There are lots of new squares, some old squares have been ‘refined’ so to speak and of course there are the ‘evergreen’ ones we always seem to have. We’ve got a nice mix from all over the gaming spectrum, hardware and game related ones and the traditional two or three Hail Mary squares which are somewhat more unlikely. Since a couple of those actually came true last year goodness knows what will happen this time around. Some business to begin with as the game leak square can indeed be crossed off from the get go (thanks Ubisoft). Be sure to tweet us @lastmincontinue as you tick things off and be sure to use the hashtag #E3Bingo as well in your tweets. Best of luck!